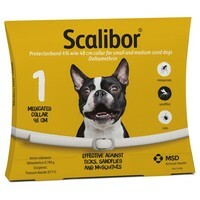 Scalibor Collars for Dogs help control the infestations of ticks, mosquitoes and flies for up to 6 months. It also has some activity against fleas and is used in some countries as a flea collar. Great product! Living in Spain we buy this collar every year for April when the ticks are out and to protect against mosquitos which spread heartworm. The price for this collar from VetUK is much better priced even with the postage to Spain then we can get here. Really glad we found this site. I live in Crete and we have a problem here with Leishmania and when I first came here, one of my dogs developed the disease. I didn't know anything about this disease until then and my vet recommended Scalibor collars. My dogs are now never without these collars, and have done now for years. I'm confident in the product and wouldn't be without them. My dogs wear these from spring to autumn each year. I live in Italy and buy them for protection against leishmaniasis and tick-borne diseases. There are a lot of ticks in the countryside during the summer and the collars work brilliantly against them. They're also supposed to offer some protection against heartworm, although I follow my vet's advice and use separate medication for that. This year the collar irritated the neck of one of my dogs for about a week, but fortunately it didn't get so bad I had to remove it. I'm hoping it won't happen again. This is a great product and we have used it for several years. It is very effective and this price is very competitive. We use it when taking dogs to Mediterranean countries mainly as a protection against sand flies. We live in Greece and have the same issue with diseases as found in many Mediterranean countries. These collars are vital to protect our dog. And they do just that!!! Cheaper than we can get locally - Thanks very much VetUK, Keep up the excellent service. Living in Spain we buy this collar every year for April when the ticks are out and to protect against mosquitos which spread heartworm. The price for this collar from VetUK is much better priced even with the postage to Spain then we can get here. Really glad we found this site. These are super collars. I live in North Northumberland and walk in woods and across fields where deer and sheep graze so Ticks are a huge problem. I put a Scalibor collar on each of my 3 spaniels in April and we are tick free all year round. So much cheaper than Frontline which has never been very effective in my situation. I read about these collars in Dog World 8 years ago and have used them and recommended them since. I have 10 dogs and always use these collars all year round but would like to point out that they are not 100% as 2 of my dogs have caught this disease although only a light dose as no medication is needed at mo but have to be regularly blood tested and my dogs are always inside early morning and in before dark when mossies are most prolific so please people make sure you do all you can to prevent this affecting your pets and always wear these collars as without them the risk is so much higher. These collars are the best defense against Leishmaniasis (which is rife on the mediterranean coasts), along with keeping your dogs indoors at dawn and dusk Please note that this disease has now come to the UK so it pays to get your dog's blood tested yearly just to check that they haven't contracted this awful disease A good tip if your dog finds the collar irritating is to remove the collar from packet and leave for approx 48 hours before putting it on your dog - has worked for my dogs. I used to live in Greece, and these collars seem effective, again for the money good value, and in hot climates could be a life saver for your dog!! I have used these collars for years - to excellent effect. But thank goodness Vet UK sells them as before I had to buy them from Bordeau in France!!! And that was very very expensive I can tell you. These are the best collars I have found for protecting your dog against ticks especially. I am out in Spain and these collars are a must!! These are the cheapest I have found anywhere, such little cost over the Sand Fly season and all year round for ticks. These collars are as good as you can get!!! PROTECT YOUR ANIMALS PLEASE!!! !